The Casio Computer Company is a multinational electronics manufacturing company. Its headquarters are based in Shibuya in Tokyo, Japan. The company manufactures a number of electronic devices like calculators, cameras, mobile phones, musical instruments and watches. The company was founded in 1946. The Casio Computer Company was among the first electronics company to manufacture quartz watches in both analog and digital models. Even before the company started manufacturing quartz watches, it had built a reputation with a number of innovative watch brands, with wristwatches being their leading products. It made a number of breakthroughs in the manufacturing of watches; including being a leader in the manufacturing of calculator watches, watches that display different time zones, display atmospheric pressures, temperatures and altitudes. In addition, they manufactured watches that included Global Positioning Systems. They manufacture a series of Casio dive watches. The Casio diver’s watches are made for sportsmen, swimmers, snorkelers and divers. They have a number of impressive features like a water resistance capability of up to 200 meters, diving logs, thermometers and a depth gauge, making Casio dive watches appealing to swimmers and divers. 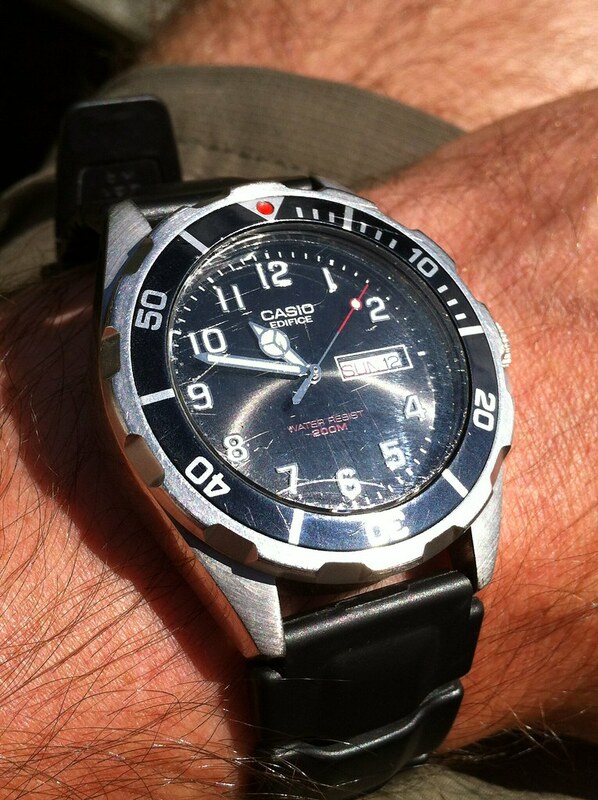 Here is a overview of some popular Casio dive watches with a brief description of features. The Casio Sea Pathfinder features an impressive collection of specs that any diver would desire in a digital dive watch. It has a depth gauge that can track dive conditions including altitude and pressure. It also keeps a diving log that shows dive time, depth and condition statistics. It comes in an impressive black design with a resin band and a water resistance ability of up to 200 meters. These Casio dive watches are truly made for the diver with the ability to automatically measure water temperature, depth, pressure and other conditions. It’s dive timer goes up to 12hours of dive time tracking, in units of 1sec or 1min measurements. It’s depth measurement ranges from zero to 80meters and the dive memory can hold up to 20 dives. This watch has a high memory space. Records can be analyzed and classed into months, maximum depth, average depth, and surface interval. The thermometer displays from 14F to 140F (-10C to 60C). Other features include daily alarm with hourly time signals and an auto calendar. It has a resin band and an auto EL backlight with an afterglow effect. Unlike the Casio Sea Pathfinder, this model of Casio dive watches is an analogue series but has impressive features. It’s sleek outlook and remarkable features makes it not just any watch but a trendy and functional timepiece. It instantly proves to be an ideal accessory for the sportsman, divers and swimmers as well as other ordinary folks who love to spend time in or near water. Pool keepers and fishermen also make use of this watch. The Casio men’s analogue diver watch has a black resin band and a robust buckle to secure it firmly to your wrist. It is a great timepiece for regular timekeeping and it also comes with a day and date display features. In low light, the numbers, hour and minute hands glow. This luminous feature enables you to tell the time easily. Another of it’s great features include its handy unidirectional bevel. This watch is light in weight and its battery life is impressive (about 3 years). It offers water resistance ability of up to 100 meters in water. Its case is made of a durable resin that will withstand nicks, dings and dents. Both analogue and digital Casio dive watches feature a great combination of style, functionality and utility. They make every day sea activities easy. They are not only great for divers, swimmers and snorkelers, but also the everyday man who spends time around water. Their awesome tracking features help divers keep track of their dives among other conditions and logs that are vital for gauging performance. As for their greatest feature, water resistance, they produce remarkable performance. Also, having a sleek sporty design doesn’t hurt! This entry was posted in Diving Gear and tagged Casio, Depth gauge, Diving watch, Global Positioning System, Japan, Manufacturing, Tokyo, Watch.